Torch cut lighting, decor, and accessories. Announcement Welcome to Manifest Station Studio! Truly handmade, one of a kind decor and gift items made to order. Recycled and upcycled items given a whole new life with my welding torch! From lamps, candle holders, nightlights, and bulk pricing for event quantities there is something for everyone, and especially for that one who has it all! Welcome to Manifest Station Studio! Truly handmade, one of a kind decor and gift items made to order. Recycled and upcycled items given a whole new life with my welding torch! From lamps, candle holders, nightlights, and bulk pricing for event quantities there is something for everyone, and especially for that one who has it all! Art deco fan pattern metal pendant light lamp plug in or hard wire. 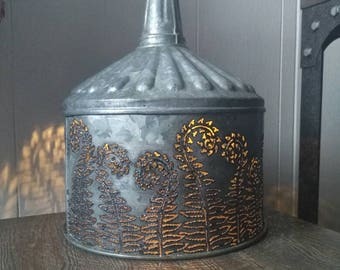 Shadow casting lamp, tin can art, recycled, welded, punched tin gift. Funnel pendant light, shadow casting. Poppy wildflower lighting. Rustic farmhouse industrial modern plug in or hardwire lamp. Kitchen light. 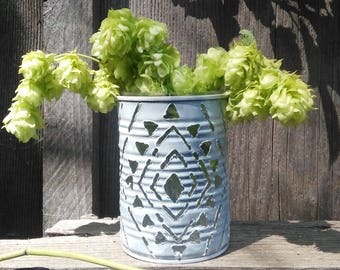 Poppy candle holders, punched metal decor candleholders, luminary torchcut, galvanized metal home decor, tin can lantern, recycled art tin. Cherry blossom hanging pendant lamp, plug in pendant light, hard wire pendant light, metal lamp shade, punched tin lamp shade, shabby chic. 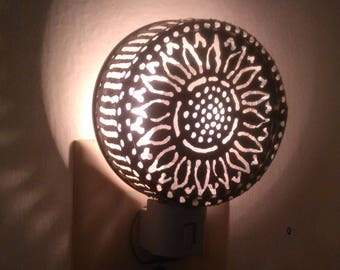 Mandala pendant shadow lamp shade, metal lighting plug in pendant light, hard wire or plug in recycled art welded art lighting. Yoga gift. Wolf shadow lamp, wolf luminary. Woodland, forest wedding, pine tree luminaries, shadow lamp. 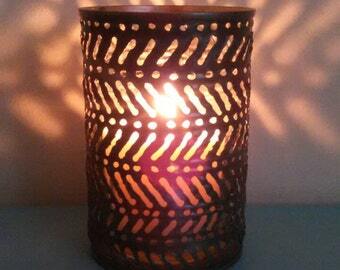 Luminary candle holder. redwood. Tree candle holder. Tin, galvanized, metal. Succulent plant pots, tiny plant holder, tealight holder, succulent pot, tin can art, wedding decor, home decor, tealight candle holders. Set of 12 luminary candle holders,mixed sizes. Forest wedding decor. Garden wedding decor. Shadow lamp. Tin lantern, rustic wedding. Pendant light, mountainscape. Plug in pendant light. Hard wire pendant light. Kitchen lighting. Bar lighting. 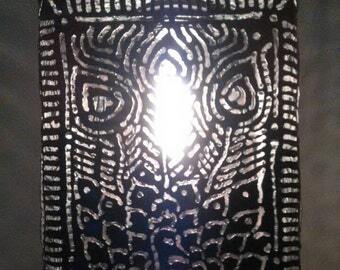 Metal lighting. Recycled art. Wolf shadow lamp pendant light. Torch cut wolf luminary tin can lanterns. Plug in pendant light or hardwire kit. Celestial star wolf lamp. Nightlights! 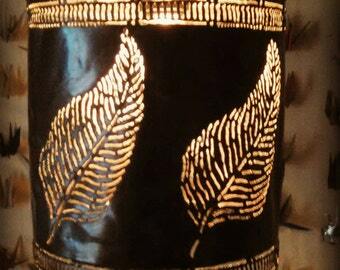 Torch cut tin cans! Sunflower pattern. 10 Wedding Candle Holders, by size. Decor, favors, all in one! Rustic, boho, beach, vintage, centerpiece. Shadow lamps. Rustic decor. I LOVE the pendant lights! They are beautiful and unique. Bird bird bird, bird is the word! Night lights make great stocking stuffers! Its all about the shadows! Pendant light boho/farm style metal lamp fixture, artistic welding, torch cut hanging lamp. Fiddlehead fern pattern. Shadow casting lamp. I just can't rest sometimes when I have an idea or image in mind that I want to see in reality! I am inspired by line quality, balance, proportion, and nature's forms. Once I have a vision of what I would like to create my mind immediately starts breaking it down into the steps involved. I agree whole heartedly with the idea that if you can dream it you can do it, and I love knowing that pieces I have enjoyed creating are being adored around the world! I learned to weld in 2003. Then, while in a cute gift shop one day I saw a tin can that had been cut through to make a sweet little luminary. I was immediately intrigued as it was metal, number one, and number two, it had a graceful fern pattern cut into it, such a contrast to the masculine metal. On closer inspection and having knowledge of metalwork I could see that it had been torch cut. This was just the beginning! I bought myself a gas welding set up, complete with tanks, regulators and a small jewelers sized torch. After making my first hanging lamp in 2004 I was hooked. Flash forward ten years to my friends wedding in 2014 and I made them about 40 to 50 lanterns for their event. As I was packing them up it occurred to me to take pictures of my work since I had so much on hand! I wanted to remember the patterns and designs I had done free hand and one at a time. Next thought was my "Aha" moment when I started my Etsy page based on those images and began "making to order". It is a classic "why didn't I do this years ago" story. But I am so happy that I am doing it now, and look forward to growing my business. Metal artist in the Sierra Nevada of California.